Kydex Holsters are a bit of science and art. As the election ran up and gun spending by the consumer was at all time highs, it seemed like everyone and their dog became custom Kydex holster mfg’s. Many of these shops have since folded. 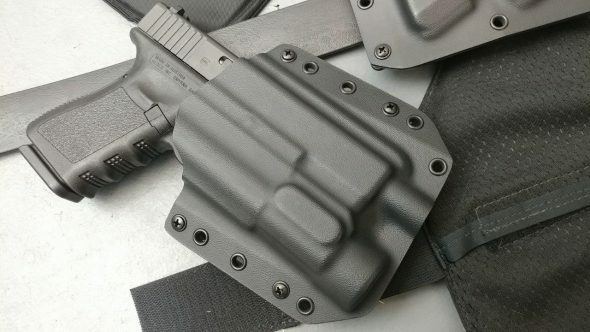 Some of the big dogs have now gone to totally different production methods and don’t even offer custom kydex anymore. (looking at you Raven) I like kydex. When a gun snaps tightly into a quality holster, it really gives you confidence in your carry piece. Bravo Concealment has sent their latest run of Kydex for T&E: The BCA Light Bearing Holster and Mag Combo. Fun Fact: Bravo was one of the first companies to send my blog something way back when I my blog was much less polished and brand spanking new. They recently reached out to me again to offer up some new gear to T&E. Let’s check it out! The BCA is a kydex pancake holster available with light and threaded barrel options. It sits at a 10 degree cant and offers a tall channel for suppressor height sights and accepts RMR equipped pistols. No custom order needed for a threaded barrel, as it is standard. Overall fit and finish is good, the edges are all polished and free of burs. Like many other light bearing designs, the holster snaps into retention on the light. Functionally the pistol draw is smooth and retention is at a level I found to be just right out of the box. That’s good since there is no means to adjust retention other than the ole hair-dryer. The holster can be adjusted to ride another 1/2 inch higher than factory if you want it a little higher on the body. It carries comfortably, and the draw is smooth. Re-holstering is easy and in no way could I engage the trigger with the holster despite trying to re-holster negligently. Light flaring for easier mag insertion. The two magazine holsters sent with the BCA were the AR PMAG pouch and the double G19 pouch. Both holsters did their job well. Adjustable retention on both allows the user to set retention strength with a single screw. The G19 magazine set was a friction fit which squeezed the body of the magazine. Draw was a constant pull for about 2/3rd the magazine length and past that point it rapidly popped out. The units functioned well with both factory and Magpul Glock magazines. Excellent combo for a basic loadout set. The PMAG holster as shipped is meant to be worn around 7 or 8 o’clock. The Gen 3 Pmag holster featured detailed molding around the PMAG and allowed the magazine to snap in. The magazine slid into the holster smoothly and then snapped in with a satisfying THUNK. The draw was smooth. The 30 round and 20 round Gen 3 PMags fit equally well. The included holster is a bullets to the rear arrangement. The PMAG holster is meant to be worn more towards your back. Reach behind and scratch your lower back. That’s the hand position that will grab the magazine and you will draw the mag and present it bullets forward. Wearing it on the hip at 9 or 10 o’clock results in bullets rearward which is not my personal preference, so I wore it more towards the back. BCA LIGHT BEARING GUN HOLSTER SUPER C-C-C-COMBO! With the death of the Raven kydex product line… many shooters lamented. With the agony and gnashing of teeth I see online, I reckon some even gave up on the 2nd Amendment forever… because their favorite holster line went bye-bye. If that is you, please be advised: The Bravo Concealment BCA is better. I am a big fan of my Raven, but the kydex line has been replaced by an injection molded thing that most people are wary of. Progress? The Raven uses a pushed in NUB to retain the light. Cheezy. I found the Bravo Concealment BCA to have superior retention. The flat shelf of the TLR1 HL was given a molding impression on the BCA that allowed it to snap in for superior retention over the well-regarded Raven. Compared Mano-a-Mano the BCA and Raven look very similar. Both rely on the TLR HL for retention… with the Raven using a pressed in NUB to retain the light and the Bravo BCA using a superior molding technique to let more of the light snap into the shape. It’s a very noteworthy point in this discussion. It retains the weapon with superior results. I found it to be just right and by comparison my Raven holster felt a little too loose. On top of that, I worry how long the nub will last over the years. The larger area where the BCA interfaces with the light makes me confident it will last and retain for many years. Slightly smaller overall footprint, better retention, ready for a threaded barrel, compatible with RMR and suppressor height sights. Bravo Concealment got it done with this holster. Both holsters offer smooth, well polished edges and both are quite comfortable to carry. The overall width of the BCA is slightly smaller than the Raven, and they both carried well. I did like the Ravens belt loops as they are turned in for a more natural bend in the belt, but otherwise I found the BCA to equally match the endangered Raven in fit and finish, but it offers superior retention. Couple that with suppressor height sight channel, a threaded barrel molded as standard, and a price running at 49.99… well forget the Phantom. It’s gone. Those Jobs Aren’t Comming Back. Don’t worry… the BCA has your back now. So before you jump on the equipment exchange looking for a linty, salt stained Raven Phantom, just save yourself the headache and purchase the Bravo BCA instead. I feel as though it’s a superior product. I wore the Bravo rig for concealed carry under a OWB untucked shirt for a few weeks, as well as using the set during a private 2 stage outlaw pistol course. I have every confidence in recommending the gear. During competition use, draws were buttery smooth and reloads were also on point. One thing I can say is that I don’t remember the holster or the magazines ever getting used. This means that they functioned exactly as intended. If they left an impression on me, it would be because something went wrong. We ran the stages front to back, and back to front for a total of 4 stages. A gentleman was kind enough to capture one of my runs here. (Thanks PETE for recording!) Sorry, it wouldn’t embed. I got it done with mostly Alphas and an occasional Bravo on those targets. What can I say, it’s been years since my last USPSA and months since the pistol came out to play. Unfortunately the Rifle stages got muddied out so we had to leave the rifle gear at home this time. I had an awesome time meeting some new shooters in my AO, and this rusty pistol guy got a chance to let the Glock Talk to some steel and cardboard again! I met with a few other shooters who were also rocking Bravo Concealment gear and they had nothing but praise. I have owned a few holsters, and I like most of them… (I research the gear I buy as well) but over the years I eventually find something that is built a bit better than the piece of gear that preceded it. In this case the Phantom is going up for sale. I would recommend the Bravo Concealment BCA Super Combo (and their OWB holsters, Glock, and Pmag Holsters) for anyone looking for a quality OWB Holster and or set. A great buy for a new shooter who wants to start a belt with the basics and it’s a great combo for more advanced shooters if you want to run all Kydex. The three-piece set is on sale HERE. I found no glaring issues with the gear and I think you will be satisfied with the setup. Disclaimer: Bravo Concealment found my blog and offered to send me the gear for test and eval. I have no financial incentive for this review and we have no financial relationship with BRAVO Concealment. The new rifleman is independently run and my opinions are my own. That’s it for now guys, guess whats coming? ACSS. Good shooting at that match. This is a timely post, since I’m in the market for a new OWB holster. But alas, curse my gun hipster ways…Bravo doesn’t make anything for either my FNS or CZ P07. Funny that you noted the move away from kydex. I had one made of bolteran a while back by a now defunct shop. Seems alright, but can’t really tell the difference. ← Let the Wallet Beatings Commence!